For most global companies, speed of ERP implementation coupled with a worldwide rollout delivery capability is critical for maximizing the ROI from ERP investments. Our ERP practice is all about integrating clients' applications into a unified platform so that they have a truly enterprise-wide information repository. With a deep understanding of the leading ERP and enterprise applications available in the market, our consultants can guide you through the selection process and help you go right software and hardware fits. CompWorldwide provide full lifecycle ERP implementation including Project Management, ERP Project implementation, Migration and production support(go-live support). We provide world-class trained consultants for design and development services. Our consultants can document requirements through system audits and studies. We service the entire life cycle of an ERP implementation project, right from system analysis and design to process modeling, development and post-implementation support. 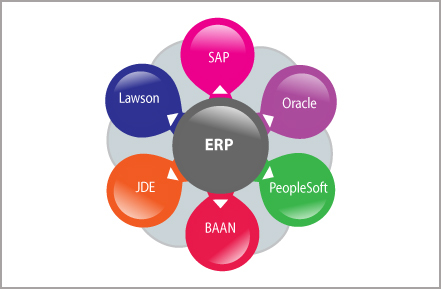 We specialize in all major ERP products including SAP, Oracle, PeopleSoft, BAAN, JDE and Lawson.